Signs are used to attract attention and convince shoppers to stop, visit, and buy. Without a clear, beautiful, and memorable sign, a store, restaurant, or office could go completely unnoticed. Many businesses are looking for a sign solution, and one option is a sign constructed from stone cladding. • The material is lightweight unlike stone slabs. • It offers the rich look of natural stone, but it can be handled much differently because it can be easily sandblasted, etched, water jet cut or routed. • Stone cladding is strong and durable, handling extreme usage and harsh elements. For example, tests have found the material to be up to 60 times more impact resistant than 3cm solid granite. It is also resistant to water penetration, earthquakes, hurricanes and vandalism. • There is a great flexibility in creating signage designs with stone cladding, including any materials used for the sign substrates in terms of their color and texture. This complete customization provides a way for businesses to create unique signage that reflects their identity and creates a great and memorable impression on customers. • It has a fast and simple installation process and does not require any specialized installers. • The stone cladding can cover existing walls rather than having to remove or dispose of them. To illustrate these benefits, Paramus Park Mall in Paramus, New Jersey had some specific signage challenges and used StonePly’s stone cladding to create attractive signs. 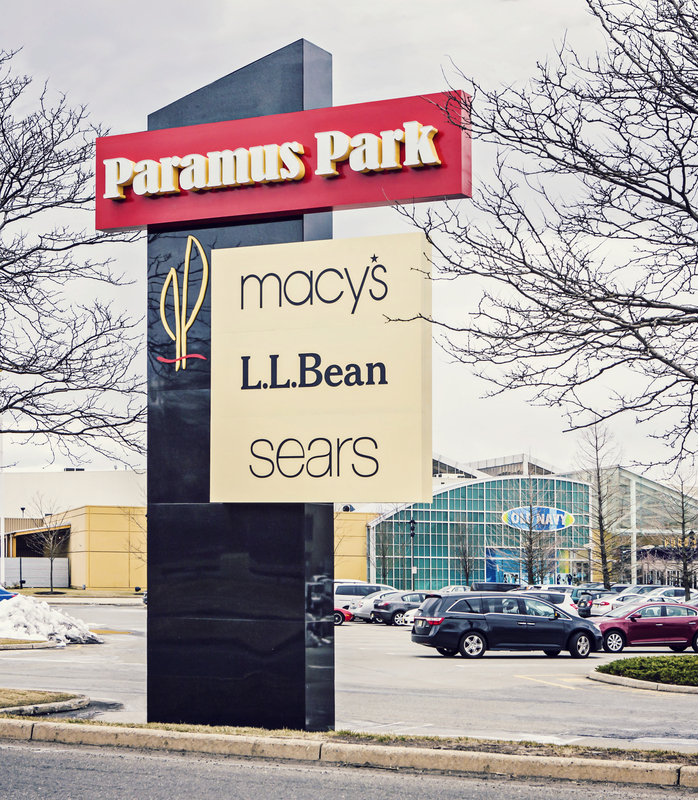 The mall wanted to attract more customers after undertaking a significant remodel to compete with other area malls, so the new signage had to reflect the new look. The massive signs had to be light, efficient, and accessible for wiring and lighting that could be installed internally. To respond to these challenges, StonePly created four large sign foundations that were placed at the mall’s parking lot entrances. The new signage was made from Black Galaxy granite. If the shopping center had tried to use granite alone for the signs, they would be too heavy. However, the stone cladding’s honeycomb backing offered a lighter weight solution. This also made installing a hatch for the signage lighting easy so that it could be effortlessly opened for any electrical work that was needed. Three of the four signs are 16 feet tall while the fourth sign stretches to 25 feet. The impressive signs not only highlight the mall’s name, but they also feature some of the shopping center’s premium retail brands, which are also illuminated. StonePly can provide you with a custom stone cladding sign that solves your current signage challenges and offers a beautiful, versatile look for your business. Our stone cladding signs have helped many of today’s top retailers, including Versace, Tommy Hilfiger, Chico’s, Ann Taylor and more. To get a free estimate, call us at 903.454.4630 or complete our contact form.